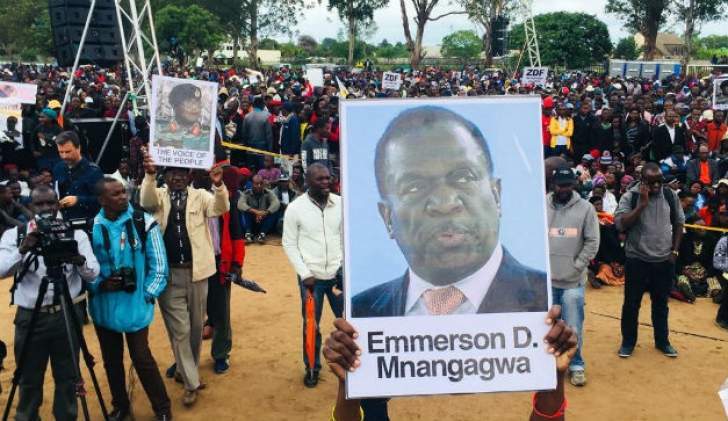 Harare - Days after US President Donald Trump signed into law the amended Zimbabwe Democracy and Economic Recovery Act aimed at renewing sanctions against Harare, Zimbabwean Presidential-elect has scoffed at the economic decision by Washington . Quizzed on Trump’s decision to renew sanctions, President Emmerson Mnangagwa said, the government will not concern itself with move by Trump. “Should I concern myself about what is happening in Washington? Do they concern themselves about us? “These discussions are necessary. He is an ambassador from the United States to Zimbabwe. He must have correct appreciation of the environment in the country. He came into the country to have that appreciation. “We were able to share his views and my views on the current situation in the country and we are moving forward as a country,” said President Mnangagwa. Earlier on, America Ambassador said Zimbabwe had registered positive developments over the past nine months, but bemoaned violent incidents that occurred on August 1, 2018. Six people died while property worth thousands of dollars was destroyed in the aftermath of the MDC Alliance claim that the recent elections were rigged. “The events of August 1 to the present had been deeply troubling to the international community and my Government in particular. President Mnangagwa’s commitment to transparency in investigating those events is very important for my Government,” said the American Ambassador. Commenting on the signing of Zdera last month, Mr Nichols said the law was meant to update a number of provisions. “This brings it in conformity with the reality and advocates for reforms in the area of democracy, human rights, economic reforms and rule of law. “These are all important steps which I know President Mnangagwa is committed to and Nelson Chamisa is committed to. We believe that this provides a framework of our cooperation with Zimbabwe,” said Nichols. “Zidera deals with loans and arrears to international financial institutions, it does not deal with individuals. What it calls for are investigation into past human rights abuse, reforms to the judicial system, promotion of rule of law. “It calls for economic reforms, land tenure, and I am sure these will be debated vigoruously in the next Parliament. He denied allegations that his country was sympathetic to the MDC Alliance as Washington had failed to condemn the wanton destruction of property by supporters of the opposition. “We do not support any particular party or persons or political figure in Zimbabwe,” he said. “The violence of August 1 2018, which resulted in death of six people, intimidation of opposition polling agents, violence in the densely populated suburbs around Harare has always been issues of concern. “The Zimbabwe Human Rights Commission has put up a statement which addresses, their view and concerns are things my Government share,” he said.